The project area to be explored within and around Papahānaumokuākea Marine National Monument (white boundary) with possible dive sites. Image courtesy of the NOAA Office of Ocean Exploration and Research, created from a synthesis of existing multibeam mapping data by Dr. John R. Smith of the University of Hawaii. Download larger version (2.7 MB). From February 25 to March 18, 2016, NOAA Ship Okeanos Explorer will explore largely uncharted deep-sea ecosystems and seafloor in and around the Papahānaumokuākea Marine National Monument (PMNM). During the 2016 Hohonu Moana: Exploring the Deep Waters off Hawai’i expedition, our at-sea and shore-based science teams will work together to make some of the first deepwater scientific observations in this area. Geographic priorities for 2016 operations include areas inside and outside of PMNM, as well as locations in international waters during our transit to the Marshall Islands. The expedition is a continuation from the 2015 Hohonu Moana: Exploring the Deep Waters off Hawai’i expedition. 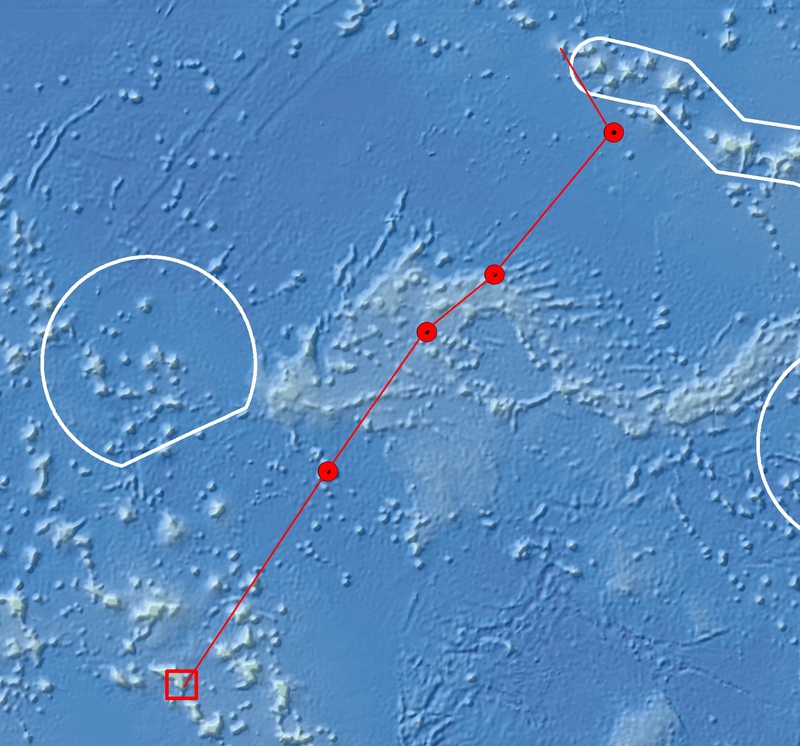 Map showing the transit path of NOAA Ship Okeanos Explorer from Papahānaumokuākea Marine National Monument to Kwajalein Atoll, with several dive sites planned along the way. Image courtesy of the NOAA Office of Ocean Exploration and Research. Download larger version (1.4 MB). Despite the role that the ocean plays in supporting our wellbeing, 95 percent of the world’s ocean remains unexplored. Increasing baseline knowledge of ocean habitats is critical to the conservation and preservation of these remarkable ecosystems. Exploratory missions, such as those conducted on the Okeanos Explorer, are necessary to expand our knowledge of the unknown and to provide baseline data for resource managers. Acquire data to support priority monument and sanctuary science and management needs. Discover and characterize vulnerable marine habitats, particularly high-density deep-sea coral and sponge communities. Collect data and geologic samples to characterize seamounts within the Prime Crust Zone. Collect information on the geologic history of central Pacific seamounts, including those that are or may be relevant to our understanding of plate tectonics and spreading centers. Collect high-resolution mapping data in priority areas. The expedition will include 24-hour operations consisting of ROV dives and mapping operations. Daytime ROV operations will focus on depths between 250 and 6,000 meters and will include high-resolution visual surveys and limited geological sample collection. Mapping operations will be conducted overnight and when the ROV is on deck. ROV dives are planned, weather permitting, from February 27 – March 14. NOAA Ship Okeanos Explorer uses telepresence technology to transmit data in real-time to a shore-based hub where the video is then transmitted to a number of Exploration Command Centers located around the country as well as to any Internet-enabled device. Access to the video combined with a suite of Internet-based collaboration tools allow scientists on shore to join the operation in real-time, and allows the general public to follow the expedition online. Image courtesy of the NOAA Office of Ocean Exploration and Research. Download larger version (1.1 MB). NOAA Ship Okeanos Explorer uses telepresence technology to transmit data in real-time to a shore-based team of scientists who will be actively participating in the expedition. Access to video coming from the ship combined with a suite of Internet-based collaboration tools allow scientists on shore to help make minute to minute decisions and observations during each dive. Telepresence also allows the general public to follow the expedition online. For this expedition, some researchers will be participating from their home institutions while others will travel to specialized locations called Exploration Command Centers (ECCs) during the cruise. 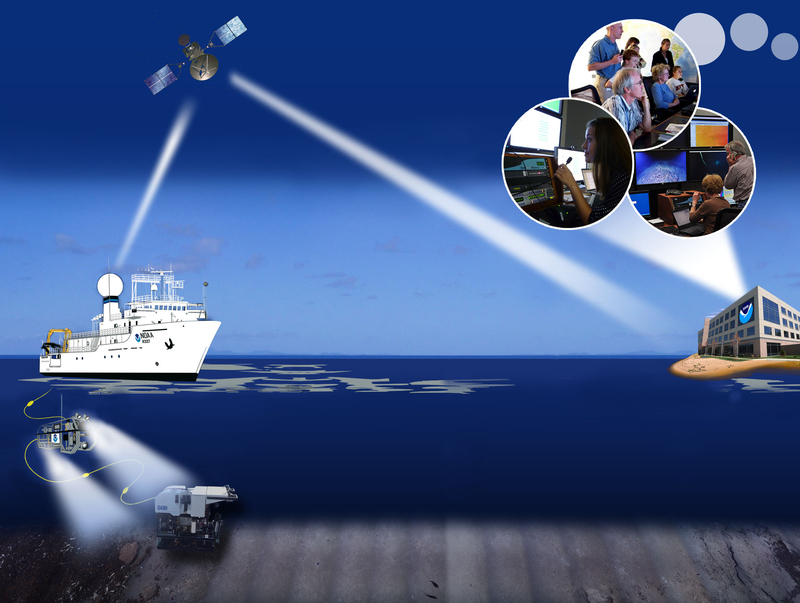 ECCs expected to be online for the expedition include those at the University of Hawaii at Manoa; NOAA's Inuoye Regional Center in Hawaii; NOAA’s offices in Maryland; Harbor Branch Oceanographic Institution in Florida; the Inner Space Center at the University of Rhode Island; and Stennis Space Center in Mississippi. This expedition provides extensive opportunities for the public to connect to the mission. The web pages for this expedition will include background content; mission logs; daily updates; videos and images; near real-time ship tracking features; and a live video feed. Educators and students can engage their classrooms through the Expedition Educational Module, which provides access to products tied to the expedition, including standards-based lesson plans, background information, ocean career connections, links to previous Office of Ocean Exploration and Research-sponsored expeditions, and more. Download a fact sheet (pdf, 2.0 MB) about the expedition. March 3: Reddit "Ask Us Anything"